That big check recently made another appearance at CBT Nuggets! 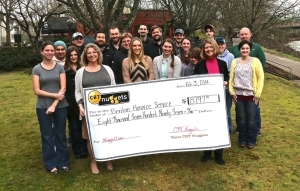 On Feb. 3, we donated $8,797 to Benton Hospice Service, our January NuggetLOVE charity. Benton Hospice Service provides in-home care for terminally ill individuals in serves Oregon’s Benton, Linn, and Lane counties. As of February 2014, NuggetLOVE has raised a total of $218,606 for various local charities ranging from the Bridgeway House to Greenhill Humane Society. The charity initiative was launched in April 2012 as a way to give back to the community. Thank you for your support — it enables us to make a difference within and outside of the IT community!